When talking to businesses worldwide, we notice that the biggest use-case for using a public cloud is as an extension for the on-premises data center because businesses need to be very flexible and agile as an Always-On Business. Mostly, on-premises data centers are scaled enough to support production workloads and services but they don’t always have the necessary resources available to support test, development and acceptance scenarios. Sometimes they don’t even have the resources necessary to test (disaster) recovery scenarios. Wouldn’t it be great if we could use cloud services at that point in time in an easy way, without too much effort? 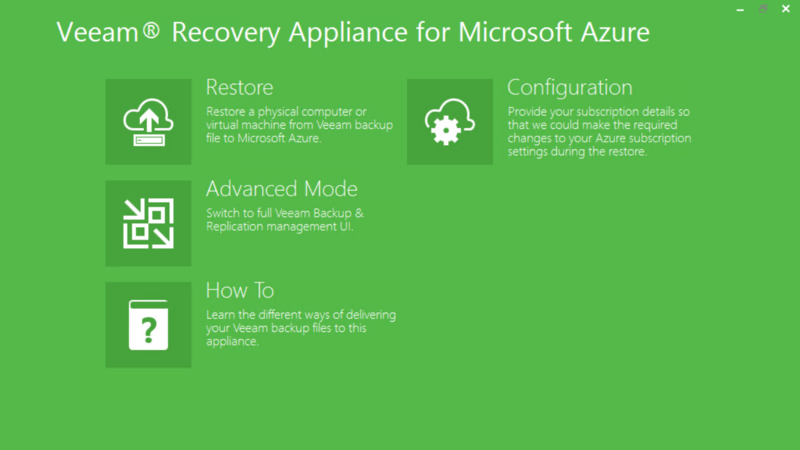 Veeam has released a new feature called Direct Restore to Microsoft Azure, and it’s available NOW in the Microsoft Azure Marketplace. This feature is specifically designed to restore Veeam backups as a virtual machine (VM) to Microsoft Azure’s Infrastructure as a Service (IaaS), and you can provision this appliance for FREE from the Azure Marketplace. It will be integrated in the next version of Veeam Backup & Replication, but it’s available as a standalone today! With this new feature, you can restore backups created with Veeam Backup & Replication, Veeam Endpoint Backup FREE and Veeam Backup Free Edition as a VM in the Microsoft Azure classic model. Moreover, these backups can come from VMs running on VMware vSphere, Microsoft Hyper-V or any physical device supported by Veeam Endpoint Backup Free. This new feature is a fully functional prerelease (not a pre-announcement like we do with many Veeam Backup & Replication features) and will be fully embedded in our next release of Veeam Backup & Replication. But there’s no need to wait – get your hands on this functionality now! Why deploy your workloads into Microsoft Azure? There are many reasons why you might want to deploy your workloads into Microsoft Azure and this feature can help you with them. Some organizations might want to effectively migrate a portion of their on-premises workloads to Microsoft Azure, and restoring the latest backup is a very effective way in doing this. But there are more use-cases for restoring your backups to Microsoft Azure. For example, you can restore your latest backup of a certain workload to perform disaster recovery testing, or you can use that same restore to test certain updates, patches or upgrades before effectively applying them to your production environment. Others will use this feature to mimic a production workload and allow developers to do their development, testing and acceptance work on it. The great things about these scenarios are that you don’t need to have the resources available on premises, you use a pay-as-you-go model and you can shut down or even remove the environment whenever the work is complete. To start, you will need to deploy Veeam Direct Restore to Microsoft Azure from the Microsoft Azure Marketplace. After deployment, you will be able to RDP into this VM to start the feature. Before you use this solution, you will need to create and attach a publish settings file first in the UI so you have access to your subscription. Simply use the wizard, go to the URL and then download and import the file. After that, you will need to upload your backups to the Veeam Direct Restore to Microsoft Azure appliance. 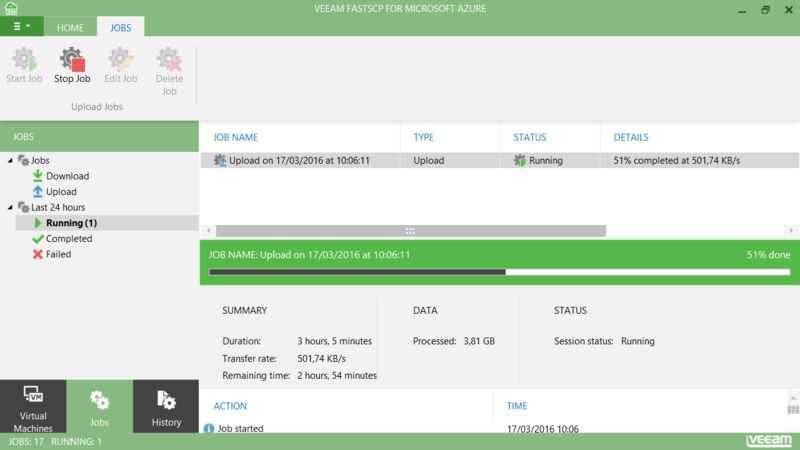 There are a few ways you can do this, such as using Azure File Storage, using RDP, attaching a VM disk to the appliance, using a FTP server, or — the easiest way — by using our free solution, Veeam FastSCP for Microsoft Azure. Please note that you only can deploy this feature in the Microsoft Azure resource manager model so before you use FastSCP for Microsoft Azure make sure you read this blogpost to enable this functionality. Lastly, you can use our very easy-to-use wizard to restore the VM to your subscription and define the parameters such as the cloud service, storage account and many more. 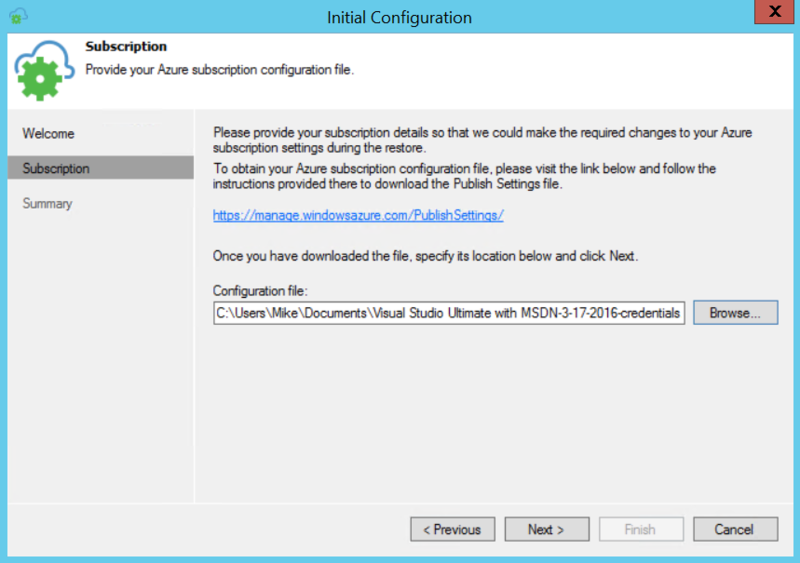 After following the wizard, the feature will take care of the rest and restore the VM to your Azure subscription. Direct Restore to Microsoft Azure offers an easy way to restore your on-premises backups to Microsoft Azure’s Infrastructure as a Service. This feature is coming to you today as a standalone solution and will be fully integrated into Veeam Backup & Replication in the near future. For many of you, this will open up a whole new set of scenarios that can help your organization in many different aspects of your IT lifecycle. 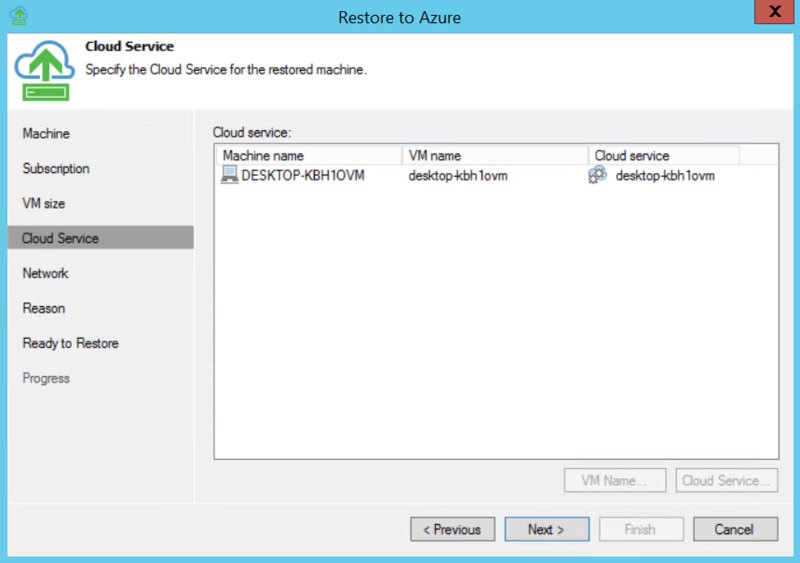 To get it now, visit the Veeam Direct Restore to Microsoft Azure page. Visit Veeam Help Center for more information and system requirements.